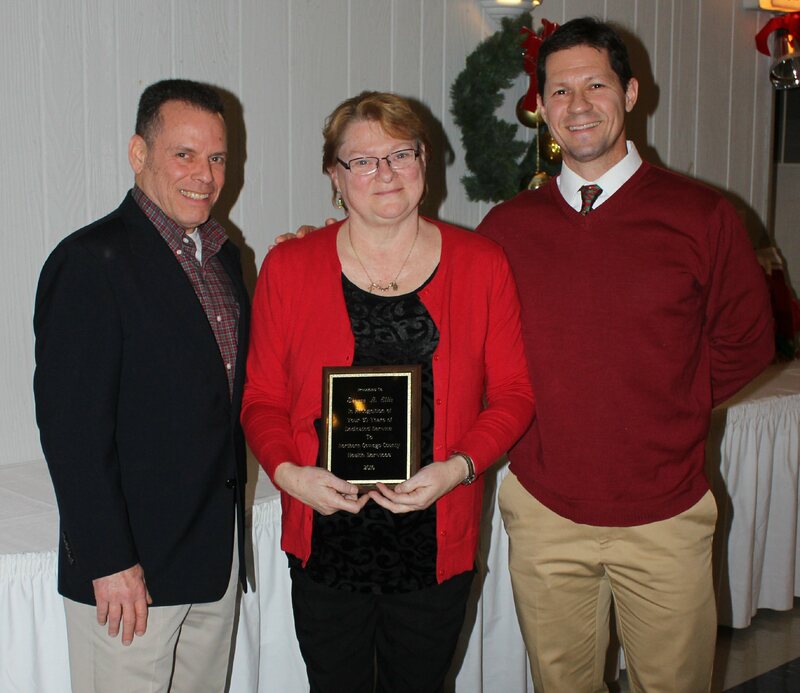 PULASKI – At its most recent annual holiday gathering, Northern Oswego County Health Services celebrated Sharon Ellis’ 30 years with the organization. NOCHSI’s president/CEO Daniel Dey (left) and senior vice president/CMO Patrick Carguello award a plaque to Nurse Practitioner Sharon Ellis for 30 years of service. Ellis is a familiar face to hundreds of children in the northern Oswego County area where her recent positions have been as a nurse practitioner in the School-Based Health Centers at the Lura Sharp Elementary School and Sandy Creek Central School. Ellis joined NOCHSI in 1986 as a Registered Nurse. She came to NOCHSI with intensive and critical care , emergency room, infection control and nursing supervision experience. After her varied 23 years in nursing roles, Ellis earned her Certificate as a Family Nurse Practitioner from Syracuse’s Community General Hospital’s Nurse Practitioner Program. Ellis transitioned to her nurse practitioner role under the tutelage of NOCHSI’s longstanding physician couple, Drs. Jay and Pat Chapman after the unfortunate death of nurse practitioner Kathy Ellis (no relation). Kathy Ellis was a pioneer as one of the first certified nurse practitioners in New York State. NOCHSI for years has offered scholarships through its Kathy Ellis Scholarship Fund. Sharon Ellis continued a vital role in addressing the pressing health care needs in the Oswego area. NOCHSI operates health centers in Fulton, Mexico, Oswego, Parish, Phoenix and Pulaski. It also operates six school-based health centers located in the APW, Mexico, Pulaski and Sandy Creek school districts. NOCHSI is accredited through The Joint Commission and is recognized by the National Committee for Quality Assurance as a Patient-Centered Medical Home. All major insurances are accepted, and a sliding fee scale discount program is available for eligible patients. For additional information on the services provided through NOCHSI call (315) 298-6564.